From its inception hip hop has had an element of bravado and aggressiveness born out of the urban ghettos from which it emerged. Over the years and with the influence of corporations, who controlled the record industry, the boasting and the beefing grew louder and uglier. At times, as with the killings of Tupac Shakur and Christopher “Biggie Smalls” Wallace as part of an East Coast-West Coast rap feud, gangbanging on wax translated into gangbanging on the streets. Whether the targets were rival artists, street organization members or loyal fans battling one another, the result was often deadly, brought more pain and deepened wounds and conflicts. Nipsey Hussle took a different approach: His music reflected his life, its realities and aspirations. But he didn’t seek out conflict or enemies and he didn’t disrespect others while elevating himself. In interviews, his words were honest, measured, wise and sincere. Banging on wax, or bringing gang and other conflict into music, wasn’t his way. He wanted to learn the lessons of yesterday and chart a different way forward. He and rappers of like minds intentionally built relationships and worked together, regardless of gang colors or neighborhoods. As he moved around the country and pursued his music and business ventures, he took that spirit with him. It touched a lot of people. The son of a Black American mother and Eritrean father had come a long way from selling CDs from the trunk of a car in the parking lot of a South Central Los Angeles strip mall. As a matter of fact, with partners and family Nipsey had purchased that same strip mall in his ‘hood, opened businesses, engaged in Bitcoin trading, created a technology center in the same place and supported organizations trying to help the Black community. And, with two trips to Eritrea, Nipsey loved and embraced his African heritage and the East African nation embraced him. It was as if this son of Africa born in America had been able to reach out with both hands across the Atlantic Ocean and build a bridge for himself and others. So, at his core, it could be said that Nipsey was a creator, a creator of music, a creator of businesses and a creator of good will. What should be done with it? We must build on it for his family and for the greater, global Black community. Basketball players have devoted their performances, their shoes and their heartfelt thanks for this brother and the inspiring life’s work of this young God, who died at age 33, allegedly at the hands of one who either knew him or was allowed access to him. We can’t stop there. 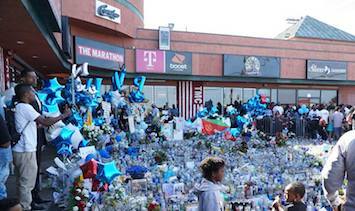 Black Twitter and social media have exploded with tributes, with a massive funeral and vigils from Los Angeles to Eritrea, music, words and memories prove the indelible impact Nipsey had on literally millions of lives. Beautiful. We can’t stop there. Street organization rivals came together to forge peace in Nipsey’s name and want to expand that peace. Wonderful. We can’t stop there. Our mission has to be rebuilding South Central Los Angeles and other areas of the country that have been devastated, purposely destroyed and neglected and Nipsey gave us a blueprint for investment and redevelopment. Acts of kindness and charity, which are necessary and part of the life of any healthy community, are wonderful but they cannot sustain a community by themselves. They need to spring from a healthy entrepreneurial and business system that profits and circulates money back into the communities that the money comes out of. That creates a healthy cycle of spending and services that makes jobs, fills needs and opens the door for more creativity, development and progress. With wealthy sports figures and entertainment figures hurt by Nipsey’s death and with over $1 trillion in Black spending power, it’s time to build a Black Economic United Front. South Central Los Angeles can be an incubator and a model of how to create and spread this effort across the country. Could there be a more fitting tribute to our brother?